Catherine is from England. She is at present spending a year teaching at a medical school in Addis Ababa, Ethiopia. Each day during the Nairobi meeting she sent news of the day’s happenings. Over the last week, over one hundred young people from around the world have arrived here in Nairobi. For many, this is their first journey of discovery in Africa. They come from many corners of the earth – from Korea to Canada, India to Italy. Yesterday a group of fourteen arrived from the Western Cape of South Africa. As part of the welcome, these young people have been invited to spend the week before the meeting sharing in the lives of families in rural parishes around Nairobi. Kiriko is one such parish, a small village nestled among coffee and tea plantations in the green and bountiful hills. The school term ended last week so the children are at home and delighted cries of "Mzungu!" (foreigner) greet us at every turn. The visitors (’pilgrims not tourists’) soon become part of the family – milking the cow, picking tea, preparing food grown on the small farms around the village or bought at the market. This is a simple life, but the welcome we receive is not lacking, in fact there is a richness and a joy which is striking. One young volunteer helping to prepare the meeting, reflecting on his time here, says: "We are not a charity, here to ’help’. We are not missionaries, here to ’preach’. We are living alongside people, simply to share". Another from Kenya adds: "Be their brother, be their sister". And there is so much to share. As one young Croatian says: "We have many of the same problems – unemployment, inequality, ethnic struggles – but here they are just more transparent, less hidden". Of course, there are different challenges here too. One farmer tells me: "We have not had rain for a week now, and the crops have not yet grown enough to survive alone. And so today we pray for rain". Meanwhile, back in Nairobi, Mji wa Furaha (’City of Joy’) is a hive of activity. 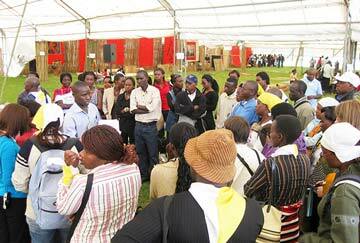 Yesterday over twenty more young people from around Kenya joined us to help with the preparations for the meeting. And every day the number of people we will welcome still grows. 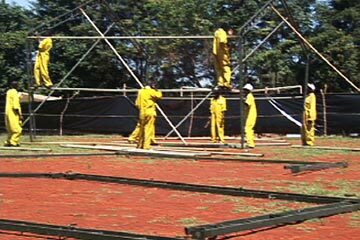 On the playing field at the Queen of Apostles Seminary next door, a huge white tent is being erected. The decoration team has been busy arranging screens of papyrus reed and bamboo, Masai kangas, and panels of red fabric painted with beautiful African patterns. Here in Kenya, the red represents the life that grows from the red iron-rich earth. Of course the decoration team is just one of many - registration, transport, cleaning, information - and a group of twenty five cooks has today started to assemble their kitchen. Just as on the hill in France, the prayers three times a day sustain the rhythm of life here. 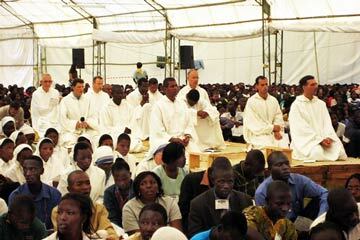 But this is not simply a replica of Taizé. 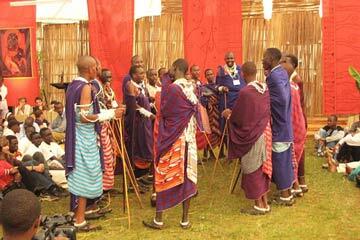 The traditions and music of the church in Kenya lend a richness to our prayer. "Tazama, tazama, ni vema na vizuri", we sing in Swahili, "ndugu kuishi pamoja kwa umoja!" (See how good it is, brother, to live together in unity!). We are often reminded here of the crucial importance of unity and of reconciliation. Tomorrow we look forward to welcoming a group of young people who are travelling from the troubled Kivu Provinces in the Democratic Republic of Congo. In our preparation meeting this morning, Fr Peter Muigai, the youth chaplain of the Archdiocese of Nairobi, shared his hopes for the meeting: "The young people who join us this week will be advocates of peace, love and reconciliation for all, because we never know what will happen tomorrow". This has been a day of welcome, which continues after the sun has set. and Mombasa – and from the suburbs of Nairobi itself. Anglicans welcoming those from the Presbyterian Church of East Africa. Once again the barriers that exist are called into question. today became a living symbol of a united human family. When the young people arrive here after their morning in the parishes, they are welcomed with a meal, shared together on the field in front of our prayer tent. The kitchen is a miracle to behold – at one end of the field, sheltered by sheets of sugar sacking, the busy team of cooks works day and night to prepare simple meals of rice or ugale (maize meal) with sauce. They cook for 7000 over small wood fires built with stones but somehow no one is left hungry. The shade of the towering eucalyptus trees and a slice of watermelon provide some relief from the heat of the midday sun. This sharing of a meal together is another symbol of the unity we seek here. Tonight after the evening prayer, Revd Francis Njoroge, Deputy Secretary General of the Presbyterian Church of East Africa, shared some thoughts with us all: "God wants to make us one community", he said, "In Him there are no barriers of tribe, nationality, race. We are one in God". In the town of Umoja, the Catholic and Presbyterian churches, which are both welcoming visitors, are working together to prepare the morning prayers – today in one church, tomorrow in another. And in one of this afternoon’s workshops we celebrated the diversity of cultures represented here, with contributions of songs and dancing from across the continent. Frère Alois also shared with us this evening: "Here in Africa, the trials that people go through do not take away their sense of dignity. Difficulties do not empty people’s lives of joy; serious situations can still leave a place for dancing. So many people refuse to give in to hopelessness. Often it is women who are on the frontline; it is they who take on so many tasks in the family and in society; and they do this with inventiveness and perseverance". We encounter some of these women in the morning programmes, visiting ’places of hope’ where they live and work. Two Kenyan girls I spoke to had visited an orphanage, a young German had been to a school for children with learning difficulties. Perhaps we are reminded more often here of the need for action in our faith – as Frère Roger wrote, of ’struggle and contemplation’. And it is people like these who teach us how this balance is not only possible but essential. This evening our prayer started spontaneously, ten minutes early, with singing and dancing brimming over with joy. It was as though the tent could not contain its praise any longer. The times of prayer we share here are so beautiful, so stirring. Our singing is accompanied by simple percussion instruments, made of seeds and bamboo, which give life to the music and carry our thousands of prayers upward with an energy and a truth that is so unique, so African. Between these moments of joy, there is also time and space for quiet reflection. In our prayers today, just as each Friday in Taizé, young people were invited to gather around the icon of the cross, to entrust to God their struggles, their burdens, their joys. The beautiful Swahili words of our singing carried us along with them: "Uje, Roho Mtakatifu, uje, Mfariji" (Come Holy Spirit, come Comforter). Frère Alois, sharing with us this evening, said: "In silence, a word from God can take root and grow in us. Sometimes, we only remember a single word. What is important is to put it into practice. It’s by putting it into practice that we come to understand it better". In our prayers here we are joined by so many – those from the eighty host parishes here in Nairobi, and from the 2500 host families, as well as brothers and sisters – the Missionaries of Charity, the Little Brothers of Jesus, the Little Sisters of the Poor. Tomorrow we will welcome a group from the Faith and Light community. Cardinal John Njue, Archbishop of the Catholic Diocese of Nairobi, also joined us for the prayer this evening. He shared with us some words of St Augustine: "Enter into yourself, and you will discover how precious you are, how dignified God has made you. Then come out of yourself and discover the person next to you, who is just as precious as you are". And he added: "Can you see how you are seated? I’m sure the person sitting next to you is from a different place, and I am happy that you are gathered together in this way. We are all sons and daughters of God, made in His image. So value yourselves and each other, you are precious". And so we start to think about what we will take home with us, how we will put this single word of God into practice, how we will value each other with a renewed energy. These days have been a time of encountering others, of openness, of exchange. Today Frère Alois shared with us: "This meeting in Nairobi has sought to contribute to building up more fraternal relationships and to leaving behind false representations of others, which can be the result of lack of contact between peoples, or the wounds of history". It is true here that meetings between people can take place within a context of a long history of injustice, inequality, violence. But then Frère Alois continued: "We cannot change the past, but during these days, we have had the joy of going beyond boundaries and of receiving from each other". There are so many small examples of these meetings between people: some Europeans sharing a meal with women from Southern Sudan to talk about life at home, a group of traditional Masai men and women decorating new friends with beautiful beaded jewellery, host families offering gifts of pineapple and bananas from their small farms. Many encounters carry a beautiful hope – the group of young people from Bukavu and Goma in the Democratic Republic of Congo shared a bus with a group from Rwanda – what a powerful symbol of our Pilgrimage of Trust on Earth. The workshops every afternoon offer more opportunities for learning from one another. Today, many gathered to share and discuss experiences of living alongside our Muslim brothers and sisters. 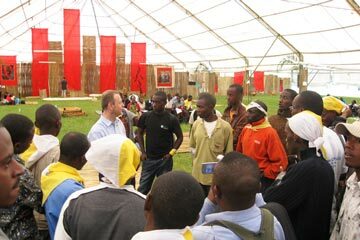 Other workshops looked at building peace, silence, small Christian communities, self-reliance projects, reconciliation. A Kenyan woman came to share her experience of being in prison here and working to develop services for prisoners. One German volunteer was struck by the openness of the young people involved: "There is so much willingness here to share and to learn". This evening the Taizé community offered a gesture of this communion, this openness to encountering others. 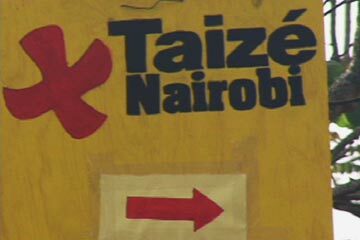 The icon of friendship which is so familiar in Taizé, and which is originally from Egypt, was given to each of the sixteen African countries represented here. "This friendship with Christ is something that we can experience together among ourselves. Let us make this friendship grow; let us overcome the separations that still exist!" Today the meeting came to an end with celebratory services in the scores of host parishes across the city. The large Catholic Church in Kariobangi was overflowing with people and resonated with the music of a beautiful choir. The Presbyterian Church in Kayole offered a thanksgiving breakfast to over 160 people from the local Protestant and Catholic churches. And the outstation church in the slum of Korogocho, improvised in a simple outdoor school amphitheatre, also welcomed visitors from across Africa and the world. Here in Korogocho we are again reminded of the vital need for action and struggle in our faith, with the church running programmes for those with drug and alcohol problems, schools for street children, vocational training schemes, cooperatives for those sorting the rubbish on the vast city dumping ground in the middle of the slum. The inequalities here are impossible to ignore, but the tireless struggle of so many against injustices is humbling and heartening. Today also brings the feast of St Andrew. One of the Sisters of St Andrew shared with us: "Ïn the Bible Andrew is often the one who brings people to Jesus. And this in many ways is our vocation too – to bring people, to gather people, never to ourselves but to Jesus, the Christ, the giver of life. And then he will allow a thousand miracles to happen in those around us". We have seen many of those miracles here this week. The people milling about in the field waiting for buses to take them home as the sun set this evening reminded us of the friendships formed, the value of the encounters made here this week. We have learned so much from one another. One of the brothers comments: "People don’t want to go home!" But our Pilgrimage of Trust on Earth is not over; indeed it is only just beginning, to be renewed again and again over the coming weeks, months, years. One of the Ugandan volunteers on the preparation team perhaps summed it up best: "I’ve learned this week that the kingdom of God is justice and peace". That seems a pretty good place to start.